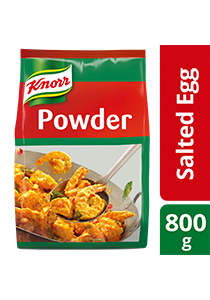 Knorr Golden Salted Egg Powder is made from real eggs helping you achieve scratch-like taste! Serve as many as 114 persons per pack! Versatile - use in stir fries, pastries, etc. Knorr Golden Salted Egg Powder is an easy to use product that delivers an authentic salted egg taste and texture with each preparation. Chicken Egg, Maltodextrin, Shortening Powder (Contains Milk Protein), Yeast Extract, Creamer (Contains Milk Protein), Flavourings (Contains Egg), Colourings. May contain traces of cereals containing gluten, soy, fish, crustacean, mollusc, peanut and tree nuts. May contain traces of cereals containing gluten, soy, fish, crustacean, mollusc, peanut and tree nuts. 3. Add in 35g of Knorr Golden Salted Egg Cooking Powder and stir over low heat till foaming is foamed. Salted egg preparations in 1 step!